Researchers from Italy's Bolzano University say they believe Egyptian Pharaoh Tutankhamun died from an infection caused by a sword cut. 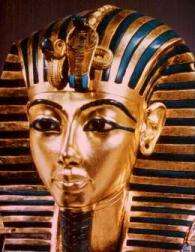 The scientists say they found traces of gold leaf bearing animal symbols in the late pharaoh's right kneecap, Italian news agency ANSA reported. That led the researchers to surmise it had fallen from Tutankhamun's raiments, lodging in a hole they believe was caused by a sword. Experts during the centuries have been unable to definitively say what caused King Tut's death. But the new discovery has led to the hypothesis a sword blow produced a fatal infection. ANSA said the findings have not yet officially been made public. An Italian newspaper said Egypt's archaeological chief Zahi Hawass was awaiting a final report before making an announcement.